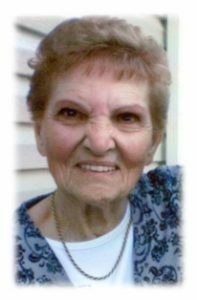 Berdine M. Dugan, age 98 yrs, of Cedar Grove, WI; formerly of Milwaukee and the town of Port Washington, WI; peacefully passed away Thursday, February 7, 2019 at her daughters home. She was born on April 5, 1920 in Canton, OH; daughter of Jacob and Lena Stephens Schlott. On June 30, 1945 in Milwaukee, Berdine married Jack D. Dugan of Milwaukee. She and her husband raised their family in Milwaukee and Mequon. For over 27 years she worked for Adelman Cleaners in Milwaukee. She also did alterations on the side, namely for Squires Shop in Grafton, Mequon Cleaners and Bayside Cleaners. She also did lots of sewing for her family and friends. Throughout their lives Berdine and her husband enjoyed getting away and taking family vacations throughout the United States. She also loved flowers and enjoyed working outside in her flower garden as a hobby. In the summer months she and her mother enjoyed canning. Her husband Jack preceded her in death on August 2, 1982. In the late 1990’s, Berdine moved north with her daughter Cindy and her family. Berdine is survived by her children Roger Dugan of Horicon, Pam (Dwain) Ward of West Bend, Rick (Joann) Dugan of Phoenix, AZ and Cindy (John) Winnemuller of Cedar Grove; 6 grandchildren Terry Ward, Jodi (Chester Snuggs) Ward, Cory (Jacqui) Dugan, Shane (Ashley) Dugan, Jackie (Ryan) Damiano and John J. ”JJ” (Ashley) Winnemuller; 3 great-grandchildren Mysti, Brianna and Colton; her two brothers Mark (Dorothy ”Dottie”) Schlott of Wooster, OH and Howard Schlott of Canton, OH; nieces, nephews, other relatives and friends. She is preceded in death by her husband Jack, her son Calvin Dugan, her sister Dolly Dorward and grandson Sean Dugan. Funeral services 10:30AM, Monday, February 11, 2019 at Wisconsin Memorial Park – Family Center, 13235 W. Capitol Drive, Brookfield, WI. The family also would like to give sincere thanks and gratitude to Sandy Young and Heartland Hospice, especially Jamie, Miranda and Kathy for the compassionate care they gave our mom. Copyright ©2019 Poole Funeral Home unless otherwise noted.